Happy Saturday, everyone! I am holding my eyes open with toothpicks here due to a serious sleep deficiency the last 3 nights (babies are so much fun! ), so I am going to keep this short and just talk about my favorite stuff on the card. 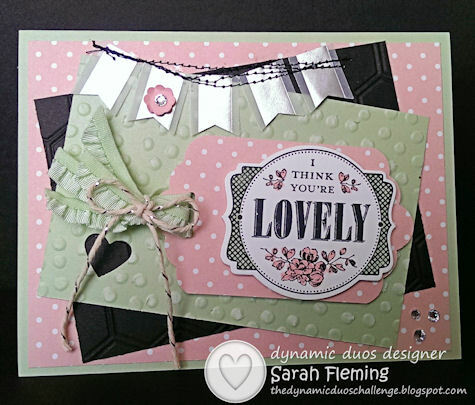 Our colors for the “Subtly Yours” challenge at Dynamic Duos this week are Pistachio Pudding (mmm, love this green) and Blushing Bride, plus your choice of neutrals. I am loving the oomph you get from black with subtle colors, so I used black, white, and a little silver. Favorite thing #1: Those little flags! I won’t lie, I felt like a little papercrafting genius when I made those. That is the new Silver Foil Designer Vellum from the Occasions catalog. I took a sheet of the diagonally-striped vellum and then centered a stripe in the new Banner punch (you can only get this punch for FREE by spending $50 now until the end of March during Sale-A-Bration). I put just a wee bit of the Tombow Multipurpose Liquid Glue on the back of each flag to hold the flags in place before I sewed them on. I did waste five flags during the making of the card — I put too much glue on the back of them, and they wrinkled up. So the second time around, just enough to hold them down. Favorite thing #2: I sewed! On a card! This is actually the first time I’ve done that. I’ve wanted to do it for ages but couldn’t actually get to my sewing machine (my craft room is also the dump-everything-that-doesn’t-have-a-place-here room). So I spent a few hours on the craft room this week so I could finally do some stitching on my cards. I actually meant this to be a neat, simple arch along the tops of the banners, but when it went wonky on the right side (I need more practice), I just went with it and did some funky stitching back and forth. I loved how it turned out, and that kind of funky sewing on cards is pretty popular these days anyway. Favorite thing #3: The tag. I used the Scalloped Tag Topper Punch (Occasions catalog) at both ends and found that the Deco Label framelits layer nicely with that. The sentiment is from the You’re Lovely stamp set (only FREE for spending $50 during Sale-A-Bration). I colored it in with my Pistachio and Blushing markers. The ribbon is the yummy Ruffle Stretch Trim that comes in all of the 2013-2015 In Colors, and the twine is the new Silver Baker’s Twine. Favorite thing #4: The embossing! For the Pistachio Pudding panel, I used Core’dinations paper and embossed it using the Decorative Dots folder (say it with me: FREE during Sale-A-Bration with a $50 order), then sanded it down so the dots pop out a little more. For the black panel, I used the Honeycomb folder and actually used the debossed side, because I liked the subtle texture there. I hope you like the card! Go see the wonderful creations the other Dynamic Duos designers have for you! You can buy most of the products I used for my card in my online Stampin’ Up! store. And you can earn the Banner punch or the Decorative Dots folder or the You’re Lovely stamp set, now through March 31 when you spend $50 (before tax and shipping). Spend $100, and you can earn two ($150 earns you all three or your choice of any 3 SAB freebies)! See all the Sale-A-Bration products you can earn for free here. And if you’ve ever considered becoming a Stampin’ Up! demonstrator, now is the perfect time! For your $99 joining fee, you receive your choice of $150 in free product (with free shipping) AND if you’re joining for the first time, you can attend Stampin’ Up!’s awesome Convention for FREE this year! They’ve never offered this before!! I went to Convention last year, and it was a BLAST. Check out this link to see all the benefits you receive as a Stampin’ Up! demo and sign up to join my team. I would love to have you! Well, I think this card is LOVELY, Sarah! All of those gorgeous layers and the foil banners just pop. SO gorgeous! I don’t know which I like better, admiring your always dynamic cards, or reading about your creative process, Sarah. Your remark about the sewing cracked me up! And your little reminders about the Sale-a-Bration are cute, too. We call that “spaced retrieval” in my business, and it works! I simply adore your card, Sarah. Lovely use of all the new goodies. The little punched out heart that allows the black to come through is a great touch! Sarah, such a beautiful card! And you sewed on it! Wow! Love the silver banners and the layout is awesome! Love all of the details with the black and silver- great job! Wow Sarah, your card is gorgeous. Love all the layers, the cute banner, and how you punched the heart so the black shows through. Very creative.